The flood crisis is causing further anguish for bereaved families as wet ground is making burials impossible in the worst-hit areas. Authorities say there is little they can do about weather-related funeral delays that have been described as “absolutely abnormal”. While families face the possibility of extra distress, the floods have created dangerous conditions for gravediggers. Crematoriums have not been immune from the issue either, with one having to close for about two months due to flooding. Poorest people cannot afford costs of dying. The poorest people in society cannot afford to pay the costs of funerals, a survey has revealed. Researchers said the average cost of dying – including funeral, burial or cremation and state administration – stands at £7,622, having risen by 7.1% in the past year. They estimate that more than 100,000 people will struggle to pay for a funeral this year. The authors of the study at the University of Bath’s Institute for Policy Research have called on the government to review the system of state support for funeral costs. In spite of the lowest recorded mortality rates for England and Wales, the cost of dying has increased over recent years. The average cost of a funeral rose by 80% between 2004 and 2013 and is expected to continue to increase. Posted in Burial, Burial stress, Cremation	| Comments Off on Poorest people cannot afford costs of dying. Dead bodies have become big business. Each year millions of people’s lives are improved by the use of tissue from the dead. 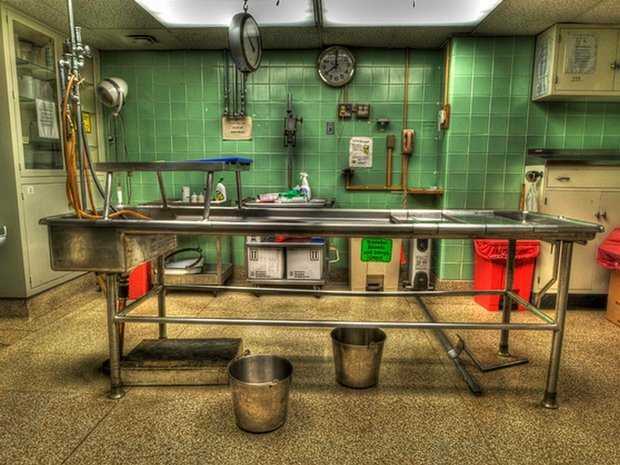 Bodies are used to supply spare parts, and for surgeons to practice on. Horizon investigates the medical revolution that has created an almost insatiable demand for body parts and uncovers the growing industry and grisly black market that supplies human bodies for a price. Posted in Burial, Cremation, practices	| Comments Off on How Much Is Your Dead Body Worth? In Tacloban, the Philippine city hit hardest by Typhoon Haiyan, hundreds of bodies are hastily buried in a long trench. More corpses lie in the streets or still covered by rubble. In a hilltop cemetery, a truck stacked high with body bags backed up to a yawning trench. With no time for ceremony, police and firefighters wearing face masks and plastic gloves unloaded the bags and placed them in a communal grave. A week after one of the strongest typhoons on record swept through the central Philippines, the task of burying the dead remains in full gear here in Tacloban, the hardest-hit city. Some bodies still lie in the streets. Other corpses remain buried under towering piles of rubble.Overwhelmed by the scale of devastation, government officials here took several days to assemble the workers and equipment necessary to undertake the grim task. This is an illustration how fragile and dependent on humanity has become on fossil fuels for burials. Without a backhoe digging a trench like the one in the picture is not a easy task. What before was a sporadic event now is a growing demand in Cuban society, commented Víctor Valdés Morales, director of the Necrology Services of Havana. According to this official, since last May, Provincial Necrology Services of the city began to offer cremation services. During this period 113 bodies have undergone this process. Valdés Morales explains that this system is a boon to the environment by reducing the number of burials in the 21 cemeteries of the capital that some present problems of availability of niches and crypts. “Current practice demonstrates that requests in funeral culture are expected to increase. By that time we will have cold storage chambers which we do not have at present and that limits to six the number of services a day,” the official explained. From tradition to will Although it may seem incredible, a survey done by this paper among inhabitants of the capital revealed that cremation is the preferred option above the old tradition of burial. The Crematorium was built in the New Guanabacoa Cemetery and was finished in January of 2006. Since then it began setting up the new incinerator, manufactured in Spain with advanced technology. The process was responsibility of technicians and assistants, specialists of the Center of Automation and Engineering of the Ministry of Informatics and Communications and engineers of the Electricity Company of the capital as well as the National Association of Innovators and Rationalization. Eyder González Caobí, one of the operators of the equipment mentioned initiatives of Cuban technicians preparing an electronic command panel and the design of a tray to deposit the body that allows a better manipulation of bones and speed up the incineration that is calculated to last, approximately, two and a half hours. Tim Morris, from the Institute of Cemetery and Crematoria Management, said: “Money needed to build new cemeteries could be saved, and spent on the living, through the re-use of graves,” he said. He said such a move would involve lifting out remains from graves that are more than 75-years-old, burying them deeper in the same grave and then re-using the space on top. A 2007 law permits this in London cemeteries but does not yet apply to the rest of England. The City of London Cemetery, which is run by the City of London Corporation, is the only cemetery preparing to “lift and deepen”. Gary Burks, superintendent of the cemetery, said: “I believe that is achievable and acceptable. And I feel that it’s appropriate for the world we live in. The bandages which Schmidt used so successfully were almost certainly steeped in human fat obtained from state executions. As these slowly became less frequent, human fat may have become harder to obtain (and more costly) back in the Old World. Its economic value was certainly well known. For, at Rushall in Norfolk in 1736, after a man and his wife had “had some words”, the husband suddenly “went out and hanged himself”. Eschewing funeral or burial, “his wife sent for a surgeon, and sold the body for half a guinea”. While the surgeon was carefully “feeling about the body”, she assured him: “he is fit for your purpose, he is as fat as butter”; after which the deceased “was put naked into a sack, with his legs hanging out, thrown upon a cart, and conveyed to the surgeons”. Every day hordes of London commuters have passed unknowingly over the bodies of thousands of their predecessors, buried a few metres under the roaring traffic and rumbling trains at Liverpool Street, and which are now being exposed for the first time by the huge Crossrail construction project. The bodies include those of mentally ill patients from Bethlem, the ancient and notorious asylum from which the word Bedlam entered the English language. Bodies that were never claimed by their families – often those of beaten, starved and exploited inmates – would have ended up in the burial ground alongside rich and poor, old and young, victims of plague and war, from across London. The walled, two-acre burial ground was opened in the mid-17th century by order of the mayor of London. It was the first built away from the city’s parish churches and their bursting, grossly overfilled graveyards and was usually known as Bedlam.